The planning of the intricate details of your special day is in full swing, and amongst a venue and the delicious menu, deciding on what kind of floral arrangement you want is a very big part of your wedding day journey. 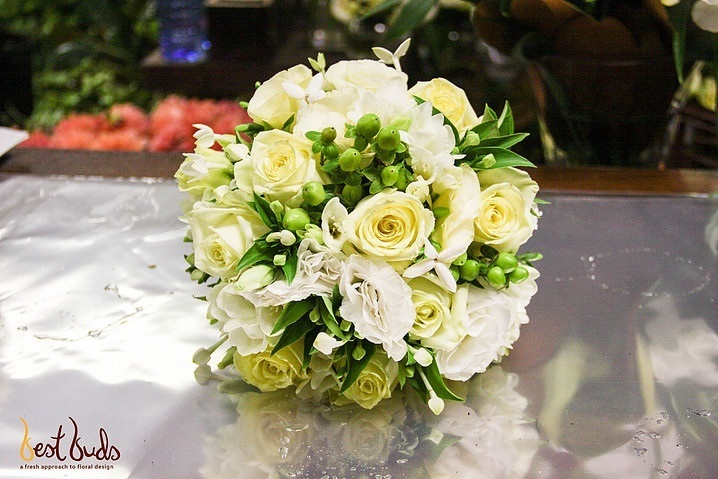 At Best Buds Floral Design, we know how important the right flowers and arrangements are to making your day exceptional. So here are a few tips on how to choose what’s best for you and your significant other. If you are going to be using a service provider or florist to design and deliver your floral arrangements on the day, the first thing they are going to want to know is, “what is your budget?”. Having an understanding of what you can afford will help them to make the best recommendations for you. If you are going to do the arranging yourself or with the help of friends and family, again it will be important to know your budget so that when purchasing your flowers and accessories, you know the boundaries within which you can play. Many brides have their hearts set on having Peonies or Tulips as their flower of choice for example and are then devastated to find out that perhaps that flower is not in season at the time of their wedding. Find out from your florist or floral designer what flowers are in bloom and readily available at the time of year you’ve chosen, this will ensure that you avoid ‘floral’ disappointment and can plan the perfect arrangement from the word go. Having a clear understanding of your colour palette as well as your wedding theme is going to make the process of creating your perfect, individualised flower arrangements much easier. Are you going with a range of pastels and neutrals like whites, creams, pinks, blues? Or have you chosen a more striking, dramatic palette with colours such as red, purple, navy or dark green? Are you having a beach wedding, or perhaps a country wedding? Are you opting for a more luxurious, city-styled theme or perhaps a forest, bohemian inspired one? No matter what your colour palette or theme is, there will be a range of beautiful fauna and flora to use that will enhance and beautify every aspect of the day. What’s important is that you and your florist know which colours to choose from and what kind of statement to make. For table arrangements, you will also want to decide on what kinds of centrepiece bases you like. Will a quirky pastel teacup suit your theme and colour palette? Or will a more dramatic crystal vase be a better statement piece for you. For the bouquets, you might want to choose an accessory or keepsake that has sentimental value to you. A charm from your Grandmother or a knick-knack from a best friend is a beautiful addition to any unique, personalised bouquet. As one of the most important and special times in your life, planning your wedding and the unique parts of it like your perfect floral arrangements is something to be treasured. For more ideas and advice on creating your perfect floral arrangement, contact Best Buds Floral Design today. Keep your eyes peeled on our Facebook and Instagram accounts for more wedding inspiration too.